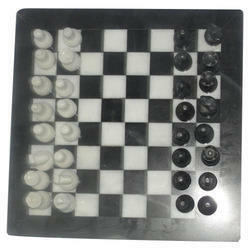 Exporter of a wide range of products which include stone chess board. Our company has established itself as a leading manufacturer, supplier and wholesaler of the superior quality Chessboard in the market at present. This one is made by our adroit professionals with the help of excellent quality material and is handmade with a perfect finish. The item offered by us is examined on predefined parameters to ensure its flawlessness, quality, and finish. Besides this, our valued clients can avail this one from us at highly competitive prices.